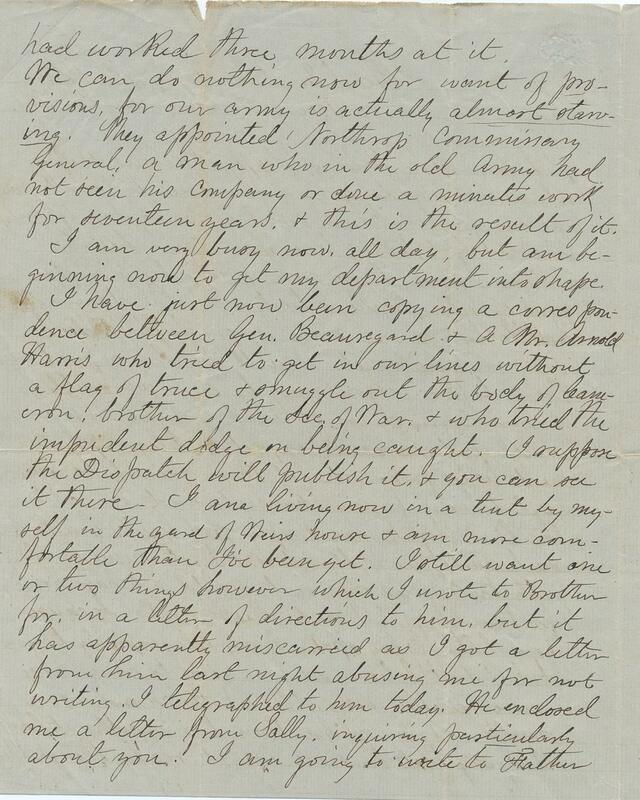 The letter also includes a description of an incident involving a man named Arnold Harris who allegedly infiltrated Confederate lines in order to recover the body of Colonel James Cameron, brother of United States Secretary War Simon Cameron. Harris was apparently captured and imprisoned in Richmond for his actions. I am very tired & sleepy Precious Wifey, but must write you a few lines to thank my Darling for her kind sweet letter, & box of candy which I got today. Bless her dear heart. I am glad to see you Presh keeping such good spirits. Really & truly now the danger of a battle to any one man is very little indeed, & in my new “posish” I will be less exposed even than before, & you may be sure we will never again have as hard a fight. You must not however expect a telegraph the next time from me (if there should be any next time.) for my chance to send one after the last fight was simply good luck. Gen. B. sent me to the office with orders, & I got mine in along with the official ones, or it would not have gone for three days. 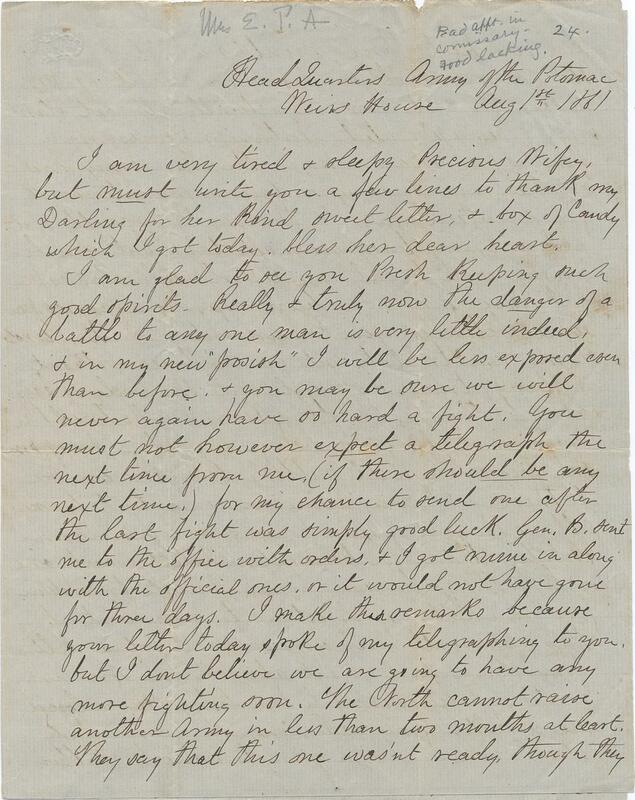 I make these remarks because your letter today spoke of my telegraphing to you, but I don’t believe we are going to have any more fighting soon. The North cannot raise another Army in less than two months at least. They say that this one wasn’t ready, though they had worked three months at it. We can do nothing now for want of provisions, for our army is actually almost starving. They appointed Northrop Commissary General, a man who in the old Army had not seen his company or done a minute’s work for seventeen years, & this is the result of it. I am very busy now, all day, but am beginning now to get my department into shape. I have just now been copying a correspondence between Gen. Beauregard & a Mr. Arnold Harris who tried to get in our lines without a flag of truce & smuggle out the body of Cameron, brother of the Sec. of War, & who tried the impudent dodge on being caught. I suppose the Dispatch will publish it, & you can see it there. I am living now in a tent by myself in the yard of Weirs house & am more comfortable than I’ve been yet. I still want one or two things however which I wrote to Brother for, in a letter of directions to him, but it has apparently miscarried as I got a letter from him last night abusing me for not writing. I telegraphed to him today. He enclosed me a letter from Sally, inquiring particularly about you. I am going to write to Father as soon as I can get time on military affairs here, & may possibly but not probably send to you to read & forward. 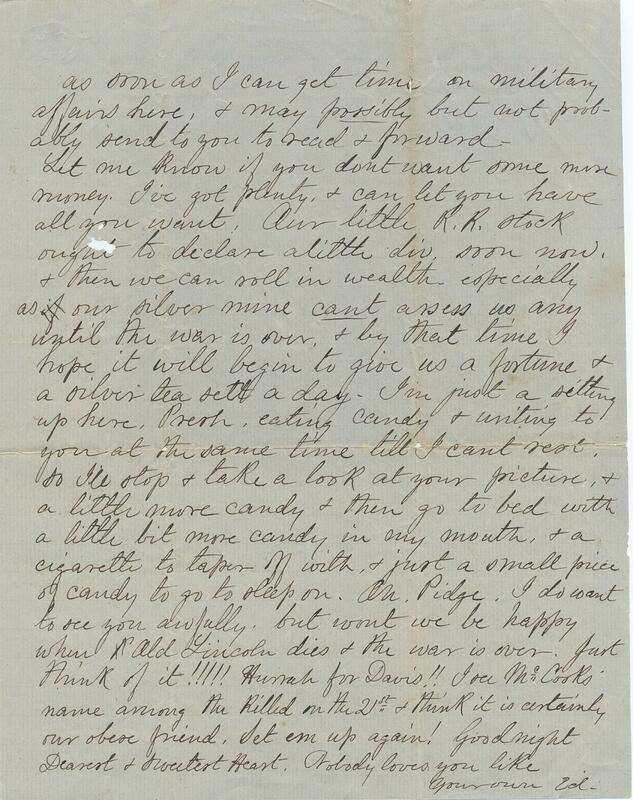 This entry was posted in Southern Historical Collection and tagged Army of the Potomac, Arnold Harris, Bettie Alexander, care packages, commissary, Edward Porter Alexander, Gen. P. G. T. Beauregard, headquarters, provisions, silver mines, Simon Cameron, stock dividends. Bookmark the permalink.